The family of song stylist Nancy Wilson invites friends and fans to attend a Celebration of Life on Saturday, March 2, 2019 at 1:30 PM at the Bel Air Church, 16221 Mulholland Dr., Los Angeles, CA 90049. The event is being produced by MCG Jazz, the non-profit organization that produced Miss Wilson’s last two Grammy award-winning CDs. Further information, when available, will be posted here as well as on Miss Wilson’s Facebook page. Contact: John Levy Enterprises, 626-398-8179. 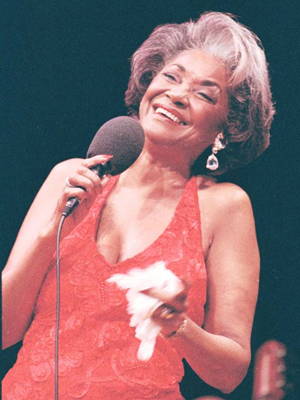 Nancy Wilson, beloved jazz vocalist who preferred to be called a song stylist, died today (December 13, 2018). She was 81. Her son, Kacy Dennis, said she passed peacefully at home after a long illness. In accordance with her wishes, there will be no funeral service. A Celebration of Life will be held, most likely in February, the month of her birth. When more details become available they will be posted on this web site. In 2004, Nancy cut back on the number of performances per year, appearing only occasionally and predominantly in concert halls, but National Public Radio listeners continue to hear her hosting repeated broadcasts of her Jazz Profiles series. She gave her fans her all for more than 60 years, recorded 67+ albums, and finally retired from public life desiring to spend all of her time with her family, especially her grandchildren. She received more awards and honors than can be listed, including an NAACP Image Award; a 2004 NEA Jazz Master Fellowship award; a 2005 Trumpet Award celebrating African-American achievement a 2005 Lifetime Achievement Award from the NAACP in Chicago; three Grammy Awards: 1965 for Best R&B Performance on her album How Glad I Am on Capitol Records; 2005 Best Jazz Vocal Album titled R.S.V.P. (Rare Songs, Very Personal) and 2007 Best Jazz Vocal Album Turned To Blue CD, both on MCG Jazz; induction into the International Civil Rights Walk of Fame in 2005; and an honorary doctorate from Juilliard School of Music bestowed in May 2012. She is survived by her son Kacy Dennis; daughters Sheryl Burton and Samantha Burton; grandchildren Lane, Sol, Shane, Chase, and Savannah; sisters Karen Davis of Lancaster and Brenda Vann of San Diego. Love and have followed your music all of my life. So happy to have met you and your team in Atlanta in the early ’90’s during the Black Art Expo Concert. So gracious, so classy and so down to earth. Much love, respect and condolences to your family. Nancy Wilson will always be my idol. I’m so fortunate to have met her. Her style, grace and elegance was unmatched. What a perfect example she set. It’s gonna take me a minute to process that she’s gone. Thank you Ms. Nancy. I saw Ms. Wilson at the Blue Note in NYC during my undergrad years at NYU. She was magical and I left feeling happy and uplifted. My favorite song, “Guess Who I Saw Today” will be on repeat in honor of you. Rest Well, Queen. Biggest compliment of my life was being compared to Nancy when I sang, one of my favorite singers of all time! Thank you for sharing your beautiful voice and heart with the world! You will forever be missed. Blessings to you and your family. RIP my beloved songstress your music and angelic voice will still be played/heard for many centuries to come. You will be miss, however, your voice and music will keep you living for ever. My Prayers are with your family. To the family, remember with Prayer, God will soothe your sorrow. Keep the faith that you all will meet again. RIP my sister, Don’t ask my neighbor! Love you my beloved sister NANCY WILSON!!! I will never forget our moments in this lifetime together! Very grateful to have had you as a friend. YOU were more than a class act! I’ll miss you Nancy, yet we are lucky enough to still have your recordings forever! My memory of you and our talks will last with me in my lifetime! Thank you, you were loved! Rest in Heaven Nancy Wilson..Nancy Wilson songs absolutely gave me life throughout my life. Her sultry voice telling stories of being a woman living and loving. So sad to know you’re gone. I am so happy that you left hours on end of your music to listen to and be able to watch your concerts on UTube. I so love you and will miss you “my” Fancy Nancy Wilson. I listened to my parent’s Nancy Wilson album “A Touch of Today” from the time I was 6 years old. I still play it today more than 50 years later. Rest In Peace Nancy. Miss Nancy, a part of my life and memories for nearly 40 years. Thank you to all her family for always sharing her with those of us who admired her talent and soul. Her music will continue to be where I turn when I need inspiration, a good cry or just pure joy. Growing up, my home was constantly filled with music, and your voice was among the angels I listened to. I fell in love with music and singing because of you. Rest in Heaven and sing with the angels again, Ms. Wilson. RIP beautiful lady, I attended many of your performances in Chicago, Los Angeles , Monterey. You always were elegant in your costumes and graceful in demeanor. There will never be another voice such as you. God blessed you with a wonderful gift which you shared with the world. So sorry to read this. I remember Nancy in high school. We watched her sing at school at West Highschool in Columbus Ohio and I and am sure many other teens at the time couldnt believe what what we were hearing. She sang like a star already on her way. Also remember her singing with Rusty Bryant in Columbus. Rest in peace and thoughts and prayers for her family. My mother and aunts played Nancy Wilson’s albums constantly. I saw her perform at either Kimball’s or Yoshi’s when I lived in SF in the 90″s. She was so elegantly radiant and sultry. I went by myself and sat at a small table in the middle of the room. I had grown up on LP’s Yesterday’s Love Song’s/Today’s Blues, How Glad I am, A Touch Of Today, Now I’m A Woman, and Can’t Take My Eyes Off Of You. Ms. Wilson set the gold standard with her renditions of Guess Who I Saw Today, Satin Doll, Have a Heart, Don’t Misunderstand and Don’t Rain On My Parade. During her performance in S.F., she played with the lyrics of Guess Who I Saw Today. When she sang It occurred to me where I’d parked the car, she melodically inserted, “Thinking of You”. It was her playfully artistic nod to the current Infiniti Q45 commercials which featured her beauty and talent. We all chuckled knowingly. Her honey infused set was exhilaratingly fresh. Not only was she a song stylist, possessed a distinctive sense of personal style that I admired. The way she presented herself. Nothing ever looked “trendy” on her. I’ve collected classic cars throughout my adult life and vividly remember the white Rolls Royce she bought from the Queen Elizabeth being featured in Jet magazine. A famous, early 60’s, Time review of her act, at the Coconut Grove, was titled “File Under Female Vocal”. It alludes to Capitol’s printed instructions for music stores on cataloging all of her albums. Ms. Wilson’s life is a testament to intelligence, master class artistry, humanity, and spirituality both on and off the stage. A lot of current black female artists need to educate themselves and emulate her. My condolences to her family and friends. May they find comfort in the joy her gift brought to the world knowing that she’s now where “Grass Is Greener, Just b. Interestingly, just like my mother didn’t want a funeral, neither did Ms. Wilson. I chose a celebration of life dinner on her birthday. From what I’ve read it seems her family will celebrate her life around her birthday too. Tonight I’m going to create a Nancy-Tini in her honor. I’ve got her albums, honey, and vodka. After a wistful tear or two, her vibrant voice will make me smile knowing heavens gates have opened and God and his angelic choir are rejoicing her arrival. Sadly most of the female vocalists today don’t even have the basic musicianship to know or sense what a great artist like Nancy was all about. Can’t make a silk purse out of a sow’s ear! I have loved the music of Nancy Wilson for over 40 years of my life! she was such a CLASS ACT, a fantastic singer, I had the pleasure of seeing Nancy in concert, and meeting her after the show, she was so nice, talked to us and signed everything I brought with me. Thank you Nancy for all the joy you gave to all your fans. My condolences to her family and friends. I can still hear that song in my head. She was elegant and beautiful. Nancy Wilson gave me a real example of grace and style. She single handedly gave me permission to be more and do more. Today, at the age of 62 – very much was and is influenced by Nancy Wilson. I was introduce to Nancy Wilson by my mother. She referred to her as the Baby Lady. For 50 years I’ve been enarmoured by by Baby Lady Wilson’s vocal range and how each of her songs bring back vivid memories of my mother and my childhood. Another Angel is singing Hallelujah in Heaven. My prayers are with her family. While I was aware of her, I really discovered Nancy Wilson in the 1980s while I was in my 20s. I think it was the Ramsey Lewis album with that scratching hit. I then started to by her Columbia LPs and CDs and listened to them endlessly throughout the 90s. I’ve since bought many earlier and later albums. Lucky enough to see her live once in the Bay Area in the 90s. There will never be another one like her. So much class, soul, musicianship, talent, and character. You live on in my heart Nancy. Your music will inspire for decades and beyond. The music of Nancy Wilson has blessed my life. What a God-given treasure. I had the opportunity to see her 5 times since 1975. Prior to that, in the 60s when I was just a girl, listened to my dad’s 8-track recordings of her. I loved the song, “Ages Ago,” and still do. She has been a blessing to me for most of my 61 years of life. I hope that her fans will be able to see the celebration of her life in February. May God bless the family of Nancy Wilson! Just the name, Nancy Wilson, meant you were going to hear fine classy music at the Sir John Hotel in Miami during the 60’s. Your style and your music could never be duplicated. I will continue to carry your music in my heart and iny Collection. I was fortunate enough to interview Nancy Wilson for The Windy City Times in Chicago when she was here doing a benefit for Roosevelt University. She was gracious, kind, and humble, with a delightful sense of humor. As I am an devoted fan, interviewing her was one of the highlights of my years as a columnist and reporter. I will never forget her impeccable style, heavenly voice and loving, warm personality. I am certain that she is with God as I write this, and I am also certain that hers will be one of the sweetest voices in heaven. Rest in peace, Nancy. God bless you and may you have everlasting life. You will be missed by me, and countless others. As a former media specialist backstage at Nancy Wilson concert at cleveland’s famous Front Row theater. Just before i gather the media reps., mayor’s office for a proclamation she stop me in a hallway…accepted the award thanking me… but quietly put it aside, introduces her daughter she brought on tour with her…..then went and sat in the audience unnoticed by fans right next to her. child of god, classy…humble…down to earth superstar……much love and continue d blessings to her family. I’ve had the pleasure of meeting Nancy, many years ago by way of her road manager Edward Roebuck, and from then on we became friends. She was the most kindest, gracious person you ever wanted to meet. I recall in my early years listening to her music ” Guess who I saw today” “How Glad I am”, and so on, never knowing that some day we would become friends. She will definitely be missed, but her life will go on through the many recordings she so graciously made over the decades. Growing up my mother had close to a dozen Nancy Wilson records. The album of that dozen that struck me the most at only 4 years old was “Kaleidescope”. Her performance of “The Greatest Performance of My Life” was sheer genius! The song that I loved even more was her rendition of “Mr. Bojangles”… it was entrancing and smoky and transforming and made me want to pursue a career in music. Nancy’s music touched a place that no singer since her ever has. Her music was healing to weary souls and inspiring at the same time. God Bless Nancy Wilson. I am grateful for you. In the 60’s and 70’s I had dreams of singing professionally. Ms. Wilson was in Denver and I went to see her. She took the time to give me a little advice. At that time, I knew all of her songs. Her selection of songs became my repertoire. I loved everything she sang. Thank you for our brief meeting and the influence you had in my life. It was a typical Sunday morning in the late ’80s, early ’90s. I was in my studio apartment in New York City. The New York Times was spread all over the floor. A bagel and a cup of coffee was within reach. Hal Jackson’s “Sunday Morning Classics” was playing in the background. I started listening to jazz vocals a few years earlier mainly focusing on female artists from the 40s and 50s — Ella, Sarah, Dinah, Billie. That morning, Hal played a song that made me stop reading. I remember just listening to that song. That voice. When it was over, Hal told us that that was Nancy Wilson. Later that day, I went to Tower Records and bought — “A Lady with a Song.” Then, I started back tracking — “Keep You Satisfied”, “Forbidden Lover”, “Nancy Now”. I have more Nancy Wilson albums in iTunes than any other artist. Nancy Wilson will always be a lady with a song. I wish to extend my sincerest condolences to her family. She touched so many people with her artistry and will be missed. I Had the pleasure of meeting this fabulous woman at one of her concerts. Such class and grace she always possessed. I will miss you Nancy but never forget you. Grace, class, talent, a lady whose music I have loved since I was 10 years old in Montreal Canada. When my day is blue I put on her records or sing along with her YouTube videos. LOVE Nancy always and blessings to the family and friends she left behind. Another jazz great has taken her seat in the heavenly choir. My thoughts and prayers are with Miss Nancy’s family and jazz fans world-wide. While I never had the honor to meet her or see her perform in person, she is my musical role model. Her musicianship set the standard for vocalists. Her discography is a national treasure. I thank God for sharing her with us. My grandfather loved your ability to add colors that only you knew how to create, How to make the many octaves in your voice close eyes and open hearts, to present yourself as the strong and magnificent classic beauty that you were and he showed me the studio over at Columbia where You, him and Peggy Lee “added a few more layers to this joint” through the years, and that you were the hottest act on Colombia behind the Beatles. You went all the way to the top of the charts. Like so many I got hooked on Ms Wilson at a very early age. Coming home from grade school there was nothing better than to hear my Mom playing a Nancy Wilson Album. As a young child my Mom even took me to see her in concert and I was just mesmerized of such beauty grace and talent and style. My mom and I shared many years together listening and collecting all the albums of Ms Wilson. I am so thankful to God, Miss Wilson and her children for letting us share in the many moments of her life and career. Surely we have been touched by an Angel. Rest In Peace Sweet Nancy and all of God’s blessings to her family. Ms. Nancy Wilson is my ALL TIME favorite!!! Whenever a question arose of favorite… anything concerning music artistry best believe my answer started and ended with Ms. Nancy Wilson. When we starting losing our musical icons, I dreaded the day I would hear of Ms. Wilson’ passing and there I was faced with the news. I literally cried real tears that ran down my cheeks and wet my pillow case. This loss was totally different from the rest. Although I never had the opportunity to meet her personally, it felt like she was an auntie. She sang my life’s songs to my core getting me through some emotional times and for that I will be forever grateful. Her beautiful voice and style painted a picture whenever she sang a lyric. Out of all the music concerts I’ve been to, I’ve seen her perform the most and was never disappointed. Though Ms. Nancy Wilson is gone from the physical she will forever remain in my heart ❤!!! Rest in Peace and in Paradise. What an inspirational woman and incredible talent. I was so sad to have heard the news. Three days before Nancy passed, I found a clipping from a 1980 issue of New York mag at a holiday market. I shared a nice moment with the guy about how much we loved her and her music. She had an amazing life and career and will be missed! My Aunt hooked me on Nancy Wilson and I was fortunate enough to meet her on a few ocassions. I remember taking my supervisor to her concert at Blues Alley in DC for her birthday. It was awesome! I’m sitting here listening to her album A Lady With a Song, one of my favourites, and marvelling at her gift. She was, indeed, a lady with a sing. For my money, the greatest song stylist of all time. Loved your music, you will be miss. I have a vivid memory of her warm smile when we met coincidentally after a show at San Bernardino’s Orange Show Auditorium. Had to be 1961 or ’62; the other act was George Shearing. I think one of her exemplary talents was evident in her choice of material. Where else could you hear a sweet version of “Sleeping Bee”? I first heard Nancy Wilson in the early 60s. When I heard ‘How Glad I Am’ in 1964 that’s when I decided to become a singer. I have the first 50 Nancy Wilson Albums which I played every day and I still do to this day. I’d like to think that you knew how much you influenced me. Rest Well Ms. Wilson, you deserve it. for there will never be another you! And for that I thank God. To the family, remember the good times and smile. So very sad to have seen on the Grammy awards memorial segment last night that my favorite songstress passed away. It was a shock!! My condolences to her family. “WINTER GREEN AND SUMMER BLUE” which is an ending song of Mr. Ken Takakura’s movie in 1984 ” 夜叉 ” ” YaKsa ” . I preferred all the while after it was heard. I’m just hearing about her passing. To the family my sincere condolence. I’ve listened to Nancy’s music all my life and so thankful that the opportunity to sit and listen to her live and in person on several occasions during my travels. Nancy is and will be one of my all time jazz favs. R.I.P. She was my idol. I have loved her since I was 7 years old and I have followed her ever since. My world is a little colder without her wonderful presence . I have every album re recorded, still collecting video clips, have the movies she appeared in, even concerts. have seen her onstage 11 or 12 times and speak of her often in my own performance, ( you think I’m not devoted?) There will never be another Nancy Wilson. I love reading all the beautiful comments about the American Treasure, song stylist Nancy Wilson, because they are also my story. I can only add that for me she is the Pied Piper of Music. I heard her enchanting voice as a kid and followed her from that moment on. I am so grateful she came to Detroit regularly and I attended so many wonderful concerts over the years. Seeing her was always a spiritual experience for me. I was honored to meet her and agree with how down to Earth, kind, charming and beautiful she was. I will miss her. And if I am blessed to reach heaven once I hug all my loved ones, I’m going straight to a Nancy Wilson concert! I hope it’s live-streamed … ! “Nancy Wilson (Center Stage) (Biography)”. Ebony Magazine at Questia Online Library. March 1, 2007. Retrieved March 16, 2014. (Subscription required ( help )) .